Looking for some DIY summer games to entertain kids? If you are, then turn your next family summer game night into your next DIY project! Despite the new school year revving up, there’s still plenty of fun in the sun this summer. Summer days are the perfect time to bond with your kids. So test your and your kid’s skills by creating summer games that are perfect for the young and young at heart. Let the games begin! But first, check out this DIY Chore Chart by Meg! Here's a clever way to keep the kids busy BEFORE the playtime begins. Build a backyard bowling alley and for sure you’ll be the envy of the neighborhood. It’s fun for kids and adults alike and is a great way to practice your pin-squashing skills without spending money at your local alley. This backyard Ker-Plank game will give children and adults a fun challenge as they try to remove the sticks without any balls falling out! I'm pretty sure players will have lots of hours challenging each other to see who wins! Summer is hot and we definitely need to cool down, so why not make a dunk tank? Kids will love the anticipation of playing and ultimately getting soaked with this refreshing dunk bucket! Easy to set up and easy to play. All you need is your household ladder and a few sheets of paper! Kids will enjoy throwing bean bags between the rungs of the ladder to earn as many points as possible. You’re going to be jealous and wish to be a three-feet tall again with this little obstacle course that is sure to provide long hours fun and entertainment! Are you up for the challenge? Grab a blanket and a partner who is under 4 feet tall. Attempt to pull your partner across the lawn as fast as you possibly can. This blanket run game is simple and fun for large family get togethers! Look for some 4×4 wooden cubes and turn them into dice, get a bucket, and prepare to roll! What's great about this amazing DIY yard yahtzee? Well, you can extend the fun even after summer! This fun game involves players having a balloon tied to their ankles while players run around the play area trying to burst other player’s balloons using only their feet. The players who can keep their balloon the longest time is the winner. Every kids dream: getting to draw all over the walls! Place this huge painted chalk board up on an outside fence and let your kids be blown with their artful creations! Dip, Dodge, Duck, Dive, and Dodge! This is pretty self-explanatory: dodgeball, but with water balloons. Need we say more? A perfect game on a very hot day. Soak a couple of t-shirt in water and put them inside plastic bags, and then keep those shirts in the freezer. Once frozen you can hold your race. The first person who can unfold and wear the frozen t-shirt, wins! 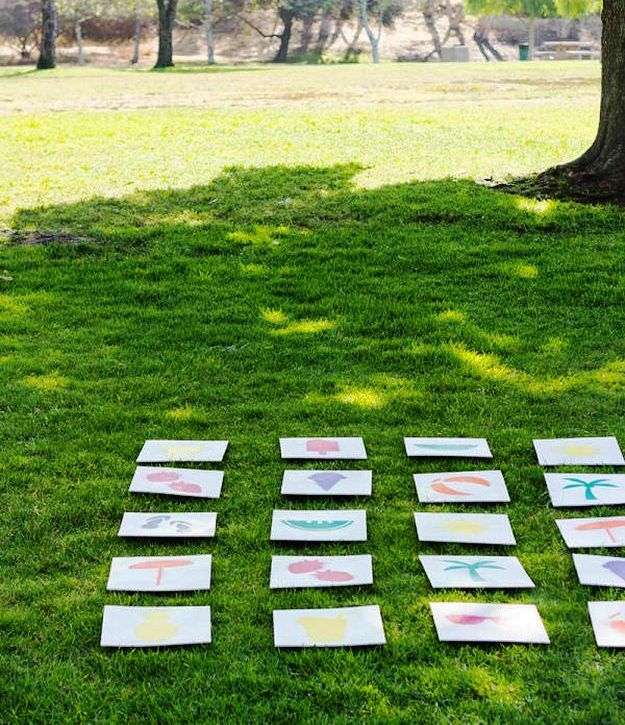 Turn your lawn into a game board with the use of circular stencils and spray paint. All members of the family will be ready for the challenge. Let see who best in twisting ones way! A great game for the backyard, picnics, and beach trips. Materials are totally reusable and tutorials include printables, making this the easiest project for the entire season. Fun for your kids but could make a really wonderful gift for a family or friend who enjoys outdoor games. Just don't forget to clear the way when the tower begins to fall! Easy and essentially free, a domino set you’ll be using with your family for years and years to come! That's one unlimited fun you can have for a very long time. Your kid would definitely enjoy exploring and experimenting with the ice block and tools. Turn a basic tub of water into an archeological dig! 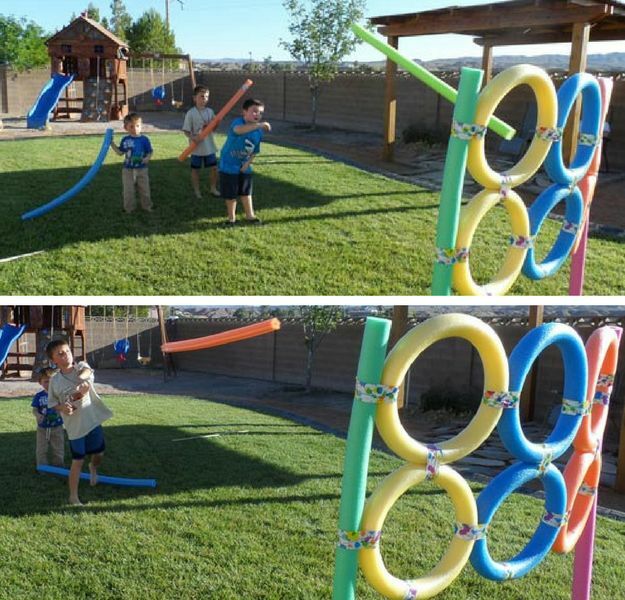 Bring the classic carnival game into your backyard with this giant ring toss and pool noodle target throwing! They’re enjoyable in or out of the water. If you’re in a creative mood, then fill each balloon with colorful paint and create a piece of art or you can simply fill it with water, either way, this balloon dart board game would turn to be an entertainment success. 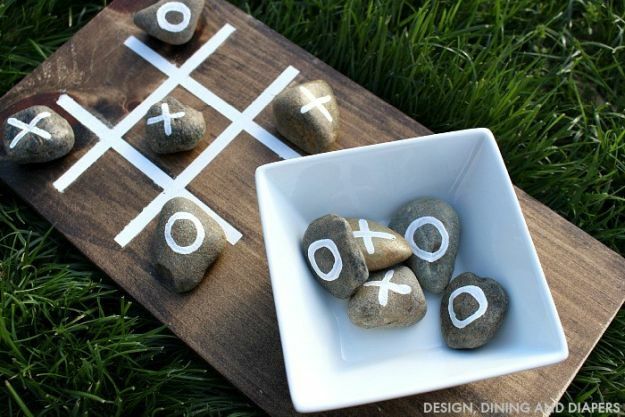 Create an outdoor tic tac toe game to keep your kids occupied during camping, backyard barbecues or just for a great bonding time. With the help of the water-guns propel plastic cups down a rope track. These cup races are fun for both young and the young at heart. Let see who's the better shooter! And now you have fun family DIY summer games for all to enjoy! Make this summer all the more memorable by spending time outside with kids. There’s nothing better than adding a little bit of competitiveness to your family bonding. Did you enjoy our list of DIY summer games? Let us know in the comments section below what your thoughts are on these game ideas. Want more cool DIY crafts to do with the kids? Check out 10 easy DIY home projects for kids you can do together!